"Prince of Glory Church, Minneapolis, Minnesota. 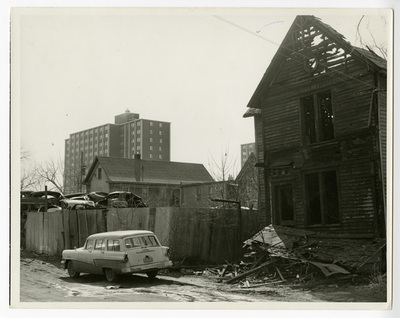 Site prior to new buil"
Prince of Glory Church, Minneapolis, Minnesota. Site prior to new building. View of site for Prince of Glory Church prior to building. Includes burnt out building and junkyard. Back labeled, "As it was".